Download these free US state flashcards today to help your child memorize! Make a fun game out of it by downloading, printing, cutting out each flash card, and then folding the name of the state over. Play a memorization game with your child, and reveal the state name once they guess. How many can they correctly answer? 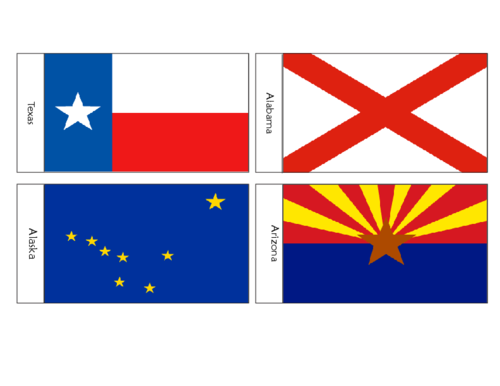 Fun fact: The official state flag of Texas, called the Lone Star Flag, was adopted in 1845 when Texas became the 28th state of the United States. The colors represent bravery (red), purity (white), and loyalty (blue). Fun Fact: Anyone who is from Alabama is referred to as an “Alabaman”, and the bordering states are: Georgia, Florida, Mississippi, and Tennessee. Fun Fact: Arizona is the sixth biggest state in the United States. Fun Fact: Alaska is the largest state within the United States. It is not directly connected to the other states; instead, it is a peninsula off of Canada.